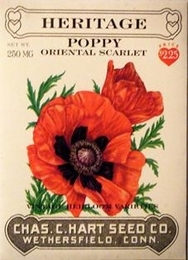 Although poppies have been known since antiquity, the Scarlet Poppy is most widely recognized world wide thanks to painting by the many artists in the garden. Thomas Jefferson mentioned adding this �larger poppy� to his garden at Monticello in 1771. The tissue-paper crimson petals with their dark eye make a vivid splash in the garden or the wildflower meadow. Blooms in early summer on 3 foot tall stems. Seed pods are often used in dry flower arrangements. A perennial which will also self-seed if pods are left in place. Poppies do not transplant well, sow seeds outdoors in early spring 6 weeks before last spring frost in full sun. press seeds into soil, covering lightly. Thin plants to stand 18 inches apart for best bloom. Prefers a rather poor, well drained, acidic soil. No need to add lime or fertilizer.